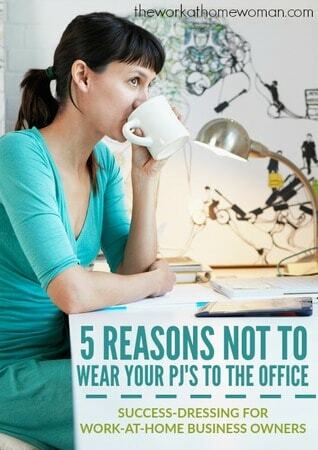 Did you start your workday at the computer in your snugglies this morning? Convenience is probably one of the reasons you started an at-home business in the first place. You can stumble from bed to coffee maker or kids’ room, to your office in less time than it takes most workers to plan their morning commute. It goes to follow that comfy clothes are a regular workday temptation. But like many other temptations, giving in is not always in your best interests. In a study of 100 women ranging in age from 21 to 64 — 96% “believed that what they wear affects how confident they feel.” (Most of us are aware that we’re judged significantly by appearance. Whether you’ve been ignored at a store for a better-dressed customer, or passed over for a promotion in the workplace, it’s likely you’ve had some direct run-in with the effects of appearance and dress. It’s 9 a.m. Your competition gets an invitation to pitch new business at a prospective client’s office in an hour. It’s a client you’ve wanted to work with for months. Your competitor is out the door and en route before you’ve figured out where you last stored your mascara. Starting your workday with a ready-for-anything appearance puts you in the power position. Own the role. Your client roster and bank account will thank you. It’s how risks are taken, and successes won. It’s elusive, though, when you feel shame around how you look. You weren’t born yesterday; you know others draw conclusions based on appearance (and, now, science supports your instincts). Will you be proud and confident to tell the person behind you in line at the coffee shop what you do for a living? Patty Buccellato is a certified image coach and founder of Refined Images. Her specialty is bringing women out of the closet with a personal style that suits their body, psyche, and circumstances. Patty established Refined Images in 1994, and while her studio is based in Bloomfield Hills, Michigan, she serves clients throughout North America in their homes, offices — and, yes, even in shopping malls! Get your FREE copy of her ebook, “How to Shop Like a Stylist” or contact her.